How much content do you need in terms of words per page and pages per subject to get a better search engine ranking? The answer greatly depends on what is normal for your industry and keywords. When you research your competitors’ sites that rank well for your keywords, some of the things you want to find out are how many indexed pages they have and how many words are on the pages that outrank yours. Analyzing these figures among your competitors gives you an indication of what level of content is currently succeeding in the search engines for your keywords. This helps you know how many pages and words you need to play in their league. Now for the best practices: you should have a minimum of 450 words of text content per page. That’s a general guideline. If all of the top-ranking pages for your keywords have more than 1,000 words each, you may want to consider 1,100 words on your page in order to compete. (Remember that there are many factors in the algorithm, and amount of content is only one of them.) But if your research hasn’t indicated that you need an unusually high number of words for your industry, 450 words gives the search engines enough content to work with and gives users a satisfying amount of information, as well. It’s a little less than one page of typed copy using a 12-point font and single line spacing. The number of words you need on a page has been steadily increasing over the years. For example, back in 1997, a typical recommended minimum was merely 75 words. Today, the number of words on top-ranked pages in some competitive markets is actually closer to 1,000 words on a page. This variance is why analyzing your competitors is so crucial. As a general rule, you should have at least five supporting pages for each theme landing page on your Web site. (A landing page is your primary page of information on a particular topic or subtopic, so it’s the page where you want users to land when they search for those keywords and click your listing.) Keep in mind that the required minimum number of pages varies depending on what your competitors have. The search engines want to return the most relevant results to a user’s search query, and they want their users to be satisfied. It makes sense that the search engines would rank most highly the sites that seem to be the experts, or authorities, in the subject the user is interested in. For instance, if you’re trying to rank for the keyword phrase Ford Mustang, you’re going up against sites that have dozens of related pages about Ford Mustangs including facts, forums, customer reviews, multimedia, and so on. That kind of competitive environment would require you to have a lot more than five pages of content on Ford Mustangs in order to be considered as much of an authority as the other sites are. You’d need to really beef up your site to make it into the top 10–20 search results. 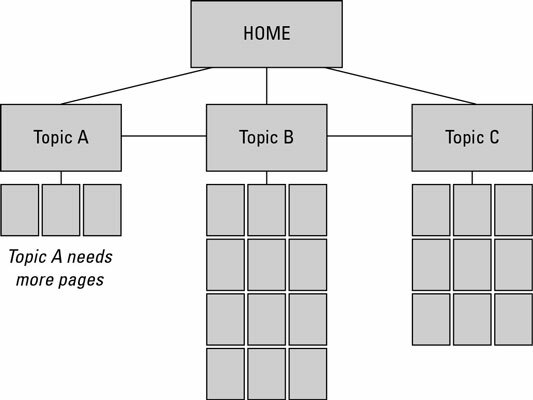 You can diagram your Web site to see where additional pages are needed. If you’ve already worked on categorizing your Web site into subject themes, you should have a good idea of what “holes” you need to fill in your Web site. Keep in mind your list of landing-page topics and what you need in terms of new content either on those pages or on supporting pages. The figure shows a sample Web site in the construction stage. As you can see, it looks like Topic A needs more pages.